Higurashi no Naku Koro ni Kai (ひぐらしのなく頃に解?, lit. When Cicadas Cry Solutions) is an anime adaptation of two of the Higurashi no Naku Koro ni Kai visual novel arcs and is a continuation of the Higurashi no Naku Koro ni anime. The series contains twenty-four episodes, which aired between July 6 and December 17, 2007. The series begins with an epilogue to the previous anime and is then divided into three chapters, the first of which is an original story arc meant to add important plot details that were left out of the first anime. The latter two chapters are Minagoroshi-hen between episodes six and thirteen, followed by Matsuribayashi-hen between episodes fourteen and twenty-four. The second season features slightly different character designs than the first season and better animation. As the result of a murder case in September 2007 in Japan involving the murder of a police officer by his sixteen-year-old daughter with an axe, as well as the Japanese media relating the case to anime such as Higurashi, the latest episode screenings of both Higurashi no Naku Koro ni Kai were canceled by a number of Japanese TV stations due to excessive violence; however, AT-X, TV Saitama and Sun TV announced that they would be airing the episodes as planned. Later, TV Saitama announced that they had ceased broadcasting of Higurashi no Naku Koro ni Kai from episode thirteen onwards. Additionally, Higurashi no Naku Koro ni Kai had its opening altered when it re-aired. Originally, a bloody bill hook cleaver (as used by Rena) was shown halfway through the opening; it was replaced with an image of a van from the series' fictional junk yard. In a direct epilogue of Tsumihoroboshi-hen, Oishi, Akasaka and Sawada visit the abandoned village to learn about the disaster and connection to Takano's file No. 34. The adult Rena informs them about Rika. 2 "Disaster Awakening Chapter One – Playing Tag"
Back in 1983, Keiichi and friends play "zombie tag" at school. Later, Irie, Tomitake and Takano inform them about the curse and murders. That night, Rika tells nothing for Satoko. 3 "Disaster Awakening Chapter Two – Powerless"
Satoko worries about Rika's prediction. She hears her arguing with a mysterious voice, telling her she will get killed in the future. 4 "Disaster Awakening Chapter Three – Pre-established Harmony"
During the festival preparations, Rika fails to warn Tomitake about his death. After Irie left the clinic and Satoko sets a trap around the house, the man inspects it. 5 "Disaster Awakening Chapter Four – The Great Hinamizawa Disaster"
After hiding Satoko, Rika is killed by the Japan Self-Defense Forces at the shrine. Satoko discovers that everyone are unconscious and she is sent to the hospital. While in her catatonic state, Satoko discovers Rena's message before dying from heart failure. 6 "Massacre Chapter One – Rules of the Labyrinth"
Rika survives and travels back in time with Hanyū. The customers participate the voting game tournament, instead of Karuta. Keiichi wins the doll for Mion to recover her feelings and potentially avoid the tragedy. Rika decides to change the story and save her friends. 7 "Massacre Chapter Two – How to Change Destiny"
Rika learns that her friends had memories within their dreams, taking place since bad events occurred. Rika tells Hanyū that she will break free from the spell. 8 "Massacre Chapter Three – Fluctuation"
Rika discovers Teppei continuing to abuse Satoko. Keiichi and friends make a plan to stop Teppei, but the government is reluctant to cooperate. Rika convinces Keiichi and friends to get Satoko back. 9 "Massacre Chapter Four – Negotiation"
After Keiichi and friends recover Satoko, she unveils Teppei's evidence. While Satoko stays at the clinic, Keiichi and townspeople make a plan at the Child Counseling Center. During the meeting, Rika realizes that she will take action. 10 "Massacre Chapter Five – Showdown"
After Keiichi and friends inform the village elders about Satoko's fate, the citizens protest the manager at the center along with the councillors. Elsewhere, Satoko refuses Teppei to steal the bank book. 11 "Massacre Chapter Six – Strong Will"
Satoko talks on the phone with Keiichi and Rika about the dam incident. After the police arrive and arrest Teppei, Satoko reunites with her friends. During the Cotton Drifting Festival, Rika predicts the future about Tomitake and Takano's fate. Back at the clinic, Takano calls out the Yamainu security forces and makes Tomitake commit suicide. She leaves him to have everyone inspect him. 12 "Massacre Chapter Seven – Hinamizawa Syndrome"
Rika tells her friends about the Hinamizawa Syndrome, regarding how that the disease whose symptoms show up when one tries to leave Hinamizawa. Rika reveals that the clinic was actually an establishment built to research it, or more specifically gather information on how to harness the disease as a biological weapon, sponsored by various bureaucratic connections collectively referred to as Tokyo. The group are tasked with maintaining the secrecy of such an operation. Irie is revealed to be innocent in this matter, as he was originally hired as a director of the institute but his actual intentions were to find a cure for the syndrome rather than to develop a biological weapon. Rika reveals that her family lineage referred to as "Queen Carriers" that have suppressed the onset of symptoms of the syndrome, and thus Rika herself is targeted by the group. Rika's friends believe her without hesitation. The police are stationed, at Rika's request, around the Furude residence to give her added protection. Meanwhile, Oishi and his assistant come across the group trespassing at a radio tower, and both are murdered when they try to question the group. 13 "Massacre Chapter Eight – Finale"
After Keiichi's friends head to the office, Rika talks with Hanyu about her upcoming death. Meanwhile, the group disable the guards and infiltrate the house, but Rika and Satoko unite with their friends. They head for the household, but Takano and the members apparently kill the rest, leaving Rika for last. Rika asks Takano to kill her without anesthesia in an attempt to carve the culprit's identity behind the murder, thus preventing the events from this and past worlds from repeating themselves. Rika is lethally gutted. The spirits of Keiichi's friends meet and agree that Hanyu must have the will to cheat death. Meanwhile, the villagers are rounded up at the school and gassed to death, while an ecstatic Takano proclaims her ascension to godhood. 14 "Festival Music Chapter One – Miyo"
From her childhood beginning, Takano's foster grandfather Dr. Hifumi develop the research of biological parasites, after Takano's parents were killed in a bus accident. Takano was sent to an orphanage, where she and her friends suffered with the abuse. While they escape, Takano is ambushed by the enraged headmaster at the forest. During adulthood, Takano continues the research and is sent to the institute as second in command alongside Irie and Tomitake. In another flashback, Takano upsets the god and wakes up, apparently dreaming the entire time. Takano looks over there and proclaims that her actions will be a continuation of Hifumi's legacy. 15 "Festival Music Chapter Two – Wriggling"
Takano contacts Hifumi and pleads for help before the call ran out of time. Takano was recaptured and returned to the orphanage, but she was soon taken to Hifumi who had looked into her plea. Later, Takano became his assistant for organizing his research for the syndrome in preparation for a presentation among peers of her colleague, Koizumi. Takano's research is rejected and even mocked by the intellectuals during the presentation, fueling young Takano's determination to continue his research and make her grandfather a "god". Takano later graduated with high honors and joined an intellectual society which could financially support her research. A few years later, Hanyū becomes upset at Takano for using the research against the village. 16 "Festival Music Chapter Three – The Beginning of the End"
The events of the dam incident are shown, including when the Hojo family first antagonized themselves against the Sonozaki family and Hinamizawa residents. It is revealed that the dam construction manager was killed by the workaholics during the rampage. Meanwhile, Takano and Irie research the syndrome at the institute, but they needed a live specimen to prove the linkage between a parasite and the onset of the syndrome. They eventually utilized one of the construction workers (who had succumbed to a state of psychosis) responsible for the murder of the construction manager as a live specimen. In another flashback, Satoshi talks with Dr. Irie regarding how he wants Satoko to stay at the clinic longer so that Satoko won't fight with her aunt at home, simultaneously lifting a burden off of himself. During all these events, Hanyū feels helpless and apologetic, but years later she and Rika eagerly await the arrival of the one person who will be the key to bringing an end to Takano's intentions. 17 "Festival Music Chapter Four – Strategy"
In order to save Satoko from the syndrome, Rika offers herself as a test subject for Irie and Takano's research, since Rika's status as a "Queen Carrier" and its suppression of the syndrome allows possible drugs to be derived from her blood. Takano prepares a plan to cover up the gassing of Hinamizawa residents as a natural disaster. Meanwhiel, Oishi investigates the deaths of Satoko's parents and implies to Dr. Irie that Satoko herself was responsible for their deaths, a consequence of a strained relationship between her and her parents. While Rika is at the clinic, her parents objected to their use as a subject, and thus Takano utilized Oyashiro's curse to cover up her murder of Rika's parents that year. The institution faces closure since treatments had been developed by Irie to combat the syndrome, despite Takano's wishes to continue research for the sake of her late grandfather. Takano meets a woman claiming that she can help her attaining personal goals. 18 "Festival Music Chapter Five – The Final Piece"
Ichiro Maebara checks the open plot of land in Hinamizawa in preparation of moving his family into the village, meeting Rika and Hanyu along the way. Rena and her father live in the village, while Rena's mother abandoned them. Satoshi exhibits stress and concern over her well-being, and had worked for a while to buy Satoko a giant teddy bear. However, Satoshi succumbs to the disease after becoming psychotic. Satoshi is henceforth taken in for experimentation, seen outwardly as his disappearance. Mion converses with Oryō about the new people in the village. Oryō refers to the newcomers as a "refreshing" presence that she can use as an opportunity to bury the hatchet over old conflicts in the village. Keiichi soon enters the Hinamizawa school as Rika and Hanyū look on, proclaiming that all the pieces have come together for the impending struggle against destiny. 19 "Festival Music Chapter Six – Opening"
Hanyū is introduced into the world as a transfer student to the Hinamizawa school. She reminiscences about Takano, and learn that she and the group are behind the evidence. Hanyu informs Rika, who apparently lost her memories. Hanyu discloses the backstory as a former god of the local land. Akasaka returns to Hinamizawa to investigate Rika's clairvoyance and her connection to the curse, and recruits Oishi along the way. Irie discloses "Emergency Manual #34" to Rika, which states that the sudden death of the "Queen Carrier" will lead to the gas eruptions for virus symptoms. Rika tries to decode the reason why Takano would try to kill her, and recruits her friends by analogizing her situation. Mion suggests that opposing factions of a secret society may be contending for power. Meanwhile, Takano works at the new research facility to set a strategy against Koizumi's Faction. 20 "Festival Music Chapter Seven – Trap"
Rika, Oishi and Akasaka present Takano to Irie and Tomitake, and enlist Tomitake to gather incriminating evidence in the shadows. Rika asserts to Oishi that the Sonozaki family is not the one behind the murder. Rika later reveals to her friends the truth of her intended murder and they manage to boost each other's morale to confront Takano's willpower together. Rika ponders that her experiences in past worlds were used, as it seems her friends have inherently learned from their past mistakes. Keiichi and Satoko devise a plan to save Rika as an effort to debunk the validity of "Emergency Manual #34". Meanwhile, Irie is still skeptical of Takano's intentions, but his suspicions are confirmed when he visits Akasaka, who is stationed at Rika's house to appear as if Rika and Satoko are in the residence (the two hide at the Sonozaki residence in the meantime). Rika and her friends attempt to enlist the help of Oishi to make a police announcement of Rika's death, but Oishi is hesitant at first. Meanwhile, Tomitake learns of Takano's connection with Koizumi, and her monetary connections with the group as a result. Irie and Oishi are surprised to learn that many of the village elders have laid down past conflicts and now preach peace with the Hojo family. Oishi enlists the others to carry out Rika. 21 "Festival Music Chapter Eight – 48 Hours"
Oblivious with Tomitake and Dr. Irie's betrayal, Takano continues on with the plan. Oishi confirms with Rika and her friends that the local precinct is on board with the announcement of Rika's death, set to be announced at dawn. The grand plan is named "Operation 48 Hours". The next day, Takano's group is sent into a scramble over the validity of the report. Meanwhile, Oishi and associates deal with the organization spy, Otaka, over the phone, who plans to come and investigate Rika's apparent death. The group led by Okonogi eventually realize that they are being attacked by an organized plan. The group attempt to find Tomitake and find a trace as a source of calls with the Investigation Bureau to prevent a leakage of the operation. Otaka arrives at the precinct, claiming to have the backing of Councilor Sonozaki, but he is on site and dispels such a claim. Meanwhile, Takano learns about Rika, becoming suspicious for Irie and Tomitake. 22 "Festival Music Chapter Nine – Offense and Defense"
While Takano keeps Tomitake hostage, the group damages the car. Takano plants a transmitter on Irie's lab coat to reveal Rika's hideout, before Shion and Kasai bring him to the Sonozaki estate. 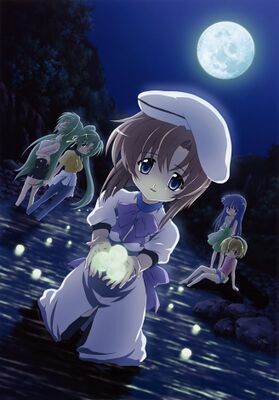 Keiichi and friends attempt to escape down the secret tunnel, but the group forces Rika to surrender herself. Before Okonogi uses the syringe, Akasaka appears and saves Rika. Keiichi and friends plan to strike back. In the midst of the formation of their counterattack, it is revealed to Shion by Irie that Satoshi is at the clinic. 23 "Festival Music Chapter Ten – Bloody Battle"
Takano interrogates with Tomitake, but takes command of the group. They head to the mountains near the estate, where Keiichi's friends lure them into various traps. While Akasaka and Kasai infiltrate the underground clinic to rescue Tomitake, Shion and Irie find the victimized Satoshi at the experimental cell. Despite his terminal condition, Irie continues the research to recover Satoshi. He tells Shion to keep it a secret. They are forced to escape from the village, due to offline communications. Satoko, Rena and Keiichi lure the group into each traps. The remaining ones are sent into a state of disarray after hearing a god-like voice over their radios apparently torturing other ones, revealed to be the impersonating voices of Hanyū and Keiichi. Takano orders Okonogi to rally the group on the radio, but Akasaka drives a van toward a blockade as the group prepare to fire nearby. 24 "Festival Music Chapter Eleven – End"
Akasaka and Tomitake eventually head to the city to call the Benken Combat Unit to stop the force. While surrendering, Takano reconciles with Tomitake and is sent to the clinic for treatment. Keiichi and friends then attend the festival. Frederica Bernkastel (one of Rika's incarnations) makes a better future, saving Takano and her parents. ↑ "Oyashirosama.com on the second anime series release date" (in Japanese). Retrieved 2007-03-22. ↑ "Teenage girl admits killing dad with ax". [[Wikipedia:The Japan Times|]]. September 19, 2007. Retrieved May 7, 2012. ↑ "Syoboi's Higurashi no Naku Koro ni TV schedule" (in Japanese). Retrieved 2007-10-01. Template:Unreliable source? ↑ 4.0 4.1 4.2 4.3 4.4 4.5 4.6 4.7 4.8 07th Expansion (December 15, 2009). Higurashi When They Cry. PC. MangaGamer. This page was last edited on 28 May 2017, at 03:22.